Wow..today the KLCI dropped -19 point at one time around 9.21am. Perhaps its T+3 forced selling for those contra players or an attempt by the syndicate to push down the KLCI to trigger a MEGA SALE!! Index linked counters really get hit very badly. By now, the KLCI has wiped out the gains that it gain during the GREEN GREEN 1st week of 2011. Thankfully, it recovered quickly to -6 points to close at 1520. 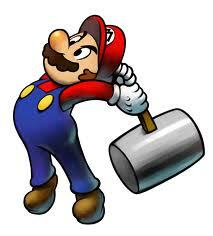 Thus, a hammer is formed. The chances of a green day tomorrow seems to be higher, hence you really need guts to buy the last few days so that hopefully you gain a handsome reward. Well stock market can be a roller coaster ride.